The Independent Spotlight is a continuing series on Stewart’s blog. The series revolves around independent artists and bands sending their music to Brett to review. No band is promised a positive review, and all music is reviewed honestly in an effort to better independent music. ‘1980 Redux,’ as described by Alien Skin, is “besotted with 1970s Berlin-era Bowie, enchanted by pre-Victorian Mary Shelley, while contorting and shape shifting into the geometric world of 1980.” Pappas’ immense desire to capture and preserve the kind of music that inspired him early in his career is admirable, especially since he digs his heels deep into the experimental nature of that 80s synth-rock period. The opening to the album, ‘1980 You Were a Boy,’ feels similar to the tracks on its predecessor, ‘European Electronic Cinema.’ Pappas’ soft, surreal crooning vocals are back, and they’re back with a familiar soundscape of bouncing, eccentric synthesizers and samples. ‘1980 You Were a Boy’ is lyrically sparse, moving its focus toward creating an enveloping, danceable atmosphere. An automated female voice is introduced as a piece of the instrumentation, too, a mainstay of the album moving forward. That automated voice is actually incorporated much heavier on the more complex ‘I Am Adam,’ a track that seeps with Laurie Anderson influence – a parallel I drew last time I delved into Alien Skin’s music. “I am Adam of your labors,” Pappas sings in allusion to Mary Shelley’s original ‘Frankenstein.’ (The Frankenstein Monster argues in the novel that he should be treated as a biblical son of sorts rather than a fallen angel.) It’s a rather beautiful, if not somewhat inherently saddening piece from the perspective of the Monster. The mood stays somber, too, with ‘Sad Ghost’ following, a tune that takes a look at the endless afterlife of a young girl from the Victorian era killed by her master. The track is spine-tingling with a heavy, quick-paced synthesizer beat that paints a sonic picture of impending dread and misfortune. It’s a mesmerizing sound, one that seems to capture the lonely life the “sad ghost” now lives. ‘Frankenstein,’ or ‘The Modern Prometheus,’ is the original Mary Shelley novel that inspired Pappas. The unique synthesizers on ‘This Fantastic Voyage’ sound like a culmination of bright synths, an organ, and perhaps, bagpipes. That’s arguably the beauty of Pappas as a composer: yes, everything is synthesized, but the palette he paints with is surprisingly versatile. ‘This Fantastic Voyage’ is uplifting, scoring the beginning of an adventure. ‘I Need Voltage,’ however, follows with a dark, eerie composition that thrives on its peculiar nature. Much like the trilogy and artist that inspired it, ‘The Berlin Trilogy’ is highly experimental in nature, perhaps even more so than anything else on ‘1980 Redux.’ With the snappy percussion and hap-hazard piano and brass-esque sessions, Pappas’ vocal delivery sounds more like spoken poetry in beat form that singing. The track tells the story of three “artisans” working in the studio in Berlin, alluding heavily to those pasty, white figures being David Bowie, Brian Eno, and Tony Visconti. It’s one of Alien Skin’s most memorable songs, perfectly capturing the ethereal, unworldly nature of the Berlin Trilogy and its creation. ‘Atoms Dangling Endlessly’ is another high point for the record, proving that Alien Skin’s most long-form musings prove to be capable of being completely enthralling. The world that ‘Atoms Dangling Endlessly’ creates is stunning, slowly growing and building around the listener as Pappas’ synthesizers continually expand. On tracks like ‘Atoms Dangling Endlessly,’ Pappas’ Eno inspiration is abundantly obvious. One of those long Berlin Trilogy era evenings with David Bowie and his collaborators. Unexpectedly, a ballad enters the fray, too, with ‘Walk on Water’ highlighting Alien Skin’s most accessible piece of music on ‘1980 Redux.’ One may not necessarily go down the street humming ‘1980 You Were a Boy’ or ‘The Berlin Trilogy,’ but you will be doing that with ‘Walk on Water.’ It’s one of the most emotional moments of the record, noticeably avoiding too much cliche and finding the perfect amount of authenticity within its stargazing sound. Avant garde inspiration flows through ‘In a Film,’ making it a less accessible jaunt than its predecessor, but no less rewarding. In fact, the final three tracks are similar in this regard. ‘The Playground of Syd Barrett,’ like its inspiration, is a weird, off-kilter journey through surreal lyricism and ‘Dark Star’ has a dark, celestial feel that evokes the final scenes of ‘2001: A Space Odyssey’ more than anything. ‘1980 Redux’ is a departure from Alien Skin’s last record, perhaps, in the sense that the songs are more cohesive than they’ve ever been. Pappas has perfected his sound, and it shows. The amount of creativity and experimentation Pappas infuses in that sound is frankly, incredible, and it makes his records a must-listen for fans of 1970s and 80s synthesizer music. It’s inspired, somewhat nostalgic music that still has a very valid place in the contemporary independent music scene. 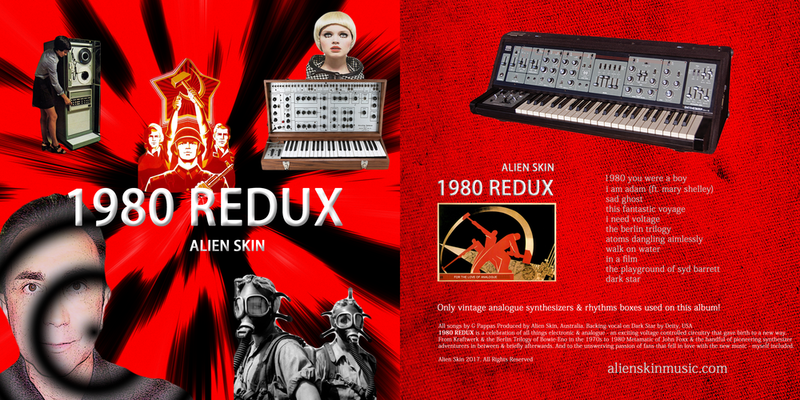 ‘1980 Redux’ is a remarkably good LP in the scope of Alien Skin’s impressive catalog. Your new album, ‘1980 Redux,’ is inspired largely by Berlin-era David Bowie, which by way of his influence, connects you to other electronic musicians of the era like Kraftwerk. Much of that music was political at the time; even Bowie was fascinated by the unstable nature of German politics at the time. A quick look at your album art shows some potential political influence. Can you can expound upon that? Pappas as the Thames, circa 1990. David Bowie in particular was turned on to Teutonic electronic music while he lived there after a disastrous, deleterious lifestyle in LA circa 1975. He breathed in his new home city’s vibrant street life, not clad in glamour but ordinary garb and daily habits. He had no car, rode a bicycle unnoticed, he dressed down and had a tiny selection of attire in his wardrobe, one pair of jeans, and roomed with Iggy Pop. He was very far removed from his Ziggy, Aladdin,White Duke, etc… alter-egos of previous years. He dropped the personas and engaged himself in the most musically experimental period of his life with the Berlin Trilogy albums: ‘Low,’ ‘Heroes’ & ‘Lodger.’ All amongst my favorite of his. He helped usher in electronic music firstly by his very public support and declaration of love for Kraftwerk and for allowing their cold, voltage controlled spirit to enter his own work, together, for the most part, with Brian Eno and Tony Visconti. This in turn dovetailed with and helped fuel the confidence of other synthesizer focused alternative British bands of that nascent period, acts such as the original pre female Human League, Ultravox with John Foxx, Cabaret Voltare, Gary Numan etc. These were exciting times. David Bowie in Berlin, 1977. Those times were also very politically turbulent, but aren’t they so today? I think we are in a far more precarious position today, internationally, than we ever were back in the 1970s. History has proven the world survived the 1970s, the cold war and onwards. As for today, history remains unwritten. The iconography I used in the artwork is simply imagery that, to me at least, has a connection with that era, including the IBM mainframe computer, the cold war and Reagan/Thatcher rightward scaremongering and sabre rattling. Have we improved much? Well, at least computers are now tiny! If I had released the album in the early 2000s I may have had the 9/11 Twin Towers on the artwork. I just wanted something that I found confronting and connected the music with the times. For me that era climaxed circa 1980, musically, and hence the title of the album. In 2016, the Independent Spotlight named your last record, ‘European Electronic Cinema,’ as one of the finest indie records of the year. How have you progressed your sound further to create sonic landscapes on ‘1980’ different than its predecessor? Furthermore, how as the Alien Skin evolved over the course of nine records? It was an honour for anyone to put to print that an album I created was one of the finest indie records of the year. I take everything with a pinch of salt but I am nonetheless grateful someone committed that to print. 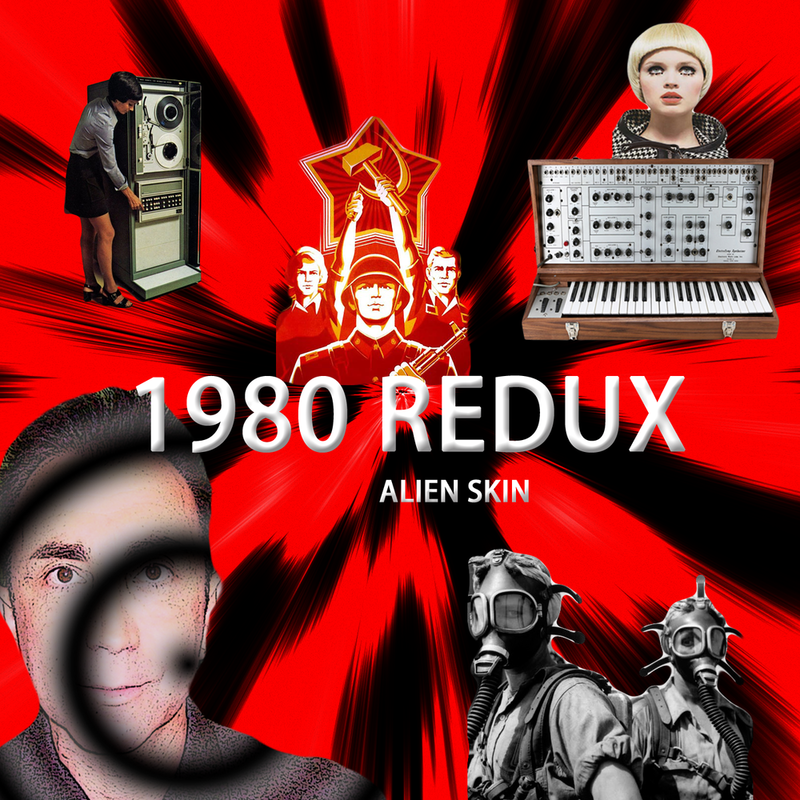 ‘1980 Redux,’ whether a casual listener can detect or not, is worlds away, most of it anyway, to whatever I did previously as Alien Skin. I purposely worked with a different method. I won’t go into technical detail as it bores most people, but the way I produced the songs meant they were always going to end up sounding the way they did. Real Life in 1997, Pappas on the far left. I wanted to create an album that referenced my electronic roots. I didn’t wish to produce a faux 80s album. That would have been pointless; it would probably have sounded lame and I would have failed. I simply wanted the spirit and memory of the era which I lived through (this is an important distinction as other people often try to do this but ironically weren’t even born at the time) to encourage and colour the songwriting, arrangements and sounds. If I listen to my albums from 2008’s debut ‘Don’t Open Till Doomsday’ to ‘1980 Redux’ my music has evolved in a very perceivable way to me. Again, to a casual listener he/she may not always pick up on the developing approach found in successive albums. I have traveled from sci-fi, funereal, melancholy and many atmospheric moods and emotions to more upbeat, yet in my opinion at least, always somewhat left of center. I find the unusual to be far more interesting and therefore some people find what I create difficult to categorize, assimilate and perhaps stay clear of it. Alien Skin is not electronic enough for the dance crowds, or sing-a-long enough for car rides or sedate enough to replace piano-only mood music while drinking a cocktail late at night. I can add another dozen things it isn’t, but for those that love it, it means everything, and to those fans I am always grateful and receptive. 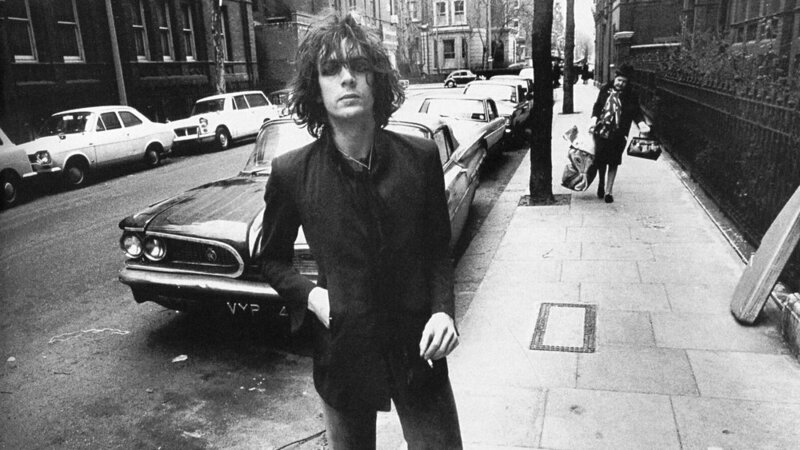 Syd Barrett, the original frontman of Pink Floyd and inspiration for Pappas. There are several allusions to your cited influences on the record, but perhaps most noticeably, ‘The Playground of Syd Barrett.’ What about Barrett captures you enough to homage him on the record? Was early Pink Floyd a definitive influence for you? Syd Barrett was the reason I first found a love of Pink Floyd. It took me years to really appreciate the post Barrett Floyd, even glossing over ‘Dark Side of the Moon.’ It’s okay because I do now love that album and all of Pink Floyd’s work and have for years and decades. They were such an innovative, brilliant band that I don’t need to add anymore than what’s already been written about them over the past 50 years. Love em! But Syd, well Syd had such an extraordinary mind. His songs in those early years were and are a beautiful delight and I rejoice listening to them still. I love his imagination, an almost childlike demeanor in song. I loved his voice, a voice that instantly attracted me to The Legendary Pink Dots, as Edward Ka-spel often sounds like him. I called the song ‘The Playground of Syd Barrett’ because that’s how I perceive his imagination, like watching children imagining scenarios in a playground and playing them out. His mind was a playground of boundless, out of the box imagination, imagery, chaos and melody. ‘1980 Redux’ is available everywhere to stream and download now. You say that the new album is a “celebration of all things electronic and analog.” Does that mission extend to the actual production of the record? Did you utilize a mixture of both analog and digital equipment? I purposely only used analog generated synthesizer sounds and beats but recorded digitally on computer as most of us do. If I wanted to go all analog, which is a big call and an expensive one, well, that would have seen me get nowhere as I couldn’t do it. Perhaps Depeche Mode or someone of that ilk could if they wanted to, but not me. I worked within my means, but all the sounds could have come from gear that was designed, played, sequenced and recorded back in 1980!